We cater for intimate weddings of 20 to 40 people, as well as bigger weddings of up to 100 people. Every wedding is tailor-made to fit with your personal preferences and ensure exclusive use of the property. Whether your style is traditional or whimsical, lavish or understated, we’d like nothing more than to you help bring your dreams of perfection to life. Both the beach and the bushveld are at your disposal, providing your photographer with the most incredible variety of backdrops. There are few settings quite as romantic, or sunsets quite as spectacular. For weddings of 40 people or less, we create intimate beach weddings on the beach deck overlooking the flowing dunes and breaking waves. 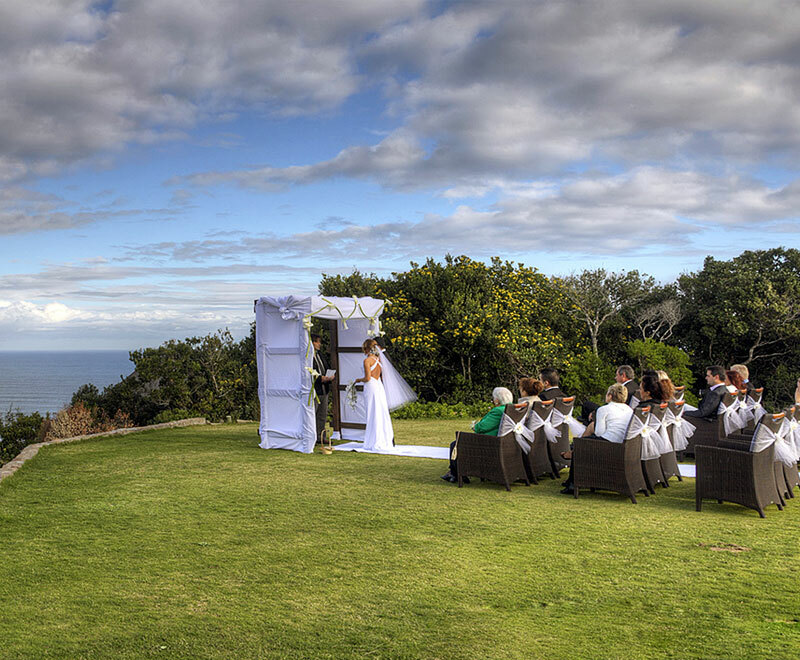 With bigger weddings of up to 100 people, we use a beautiful grassed area that overlooks the lodge, reserve and Indian Ocean. Both options are designed and prepared to be picture perfect, with unique and special touches to create fond memories of your special day. Your reception is held in the courtyard area central to the Lodge, with easy access to the rest rooms and private use of the indoor lounge areas. The reception area is covered with a Bedouin tent, creating a stylish, intimate and warm atmosphere. Delicious canapes are served to your guests while you are having your photographs taken. Dinner consists of a three course menu and you are invited to discuss and sample various menu options before making your decision. Oceana weddings aren't just about your special day. Instead, they’re a full weekend affair - unrushed and relaxing, with everything taken care of. You can expect to arrive on a Friday afternoon for sundowners in the reserve or on the beach. This is followed by a casual, intimate dinner with family and friends. On the day, you can expect to awaken to mesmerising views over the Indian Ocean and enjoy a decadent champagne breakfast. Get dressed in the Private House, surrounded by your dearest, then leave for the wedding ceremony of your dreams. After an hour or two of photographs, join your guests for a warm reception, followed by an evening of celebrating your union. Sunday morning brings new beginnings as Husband & Wife - best started with a romantic beach breakfast and game drive.